All photos © 2008 TFG/Abby Weissman. From the Flubber Gallery collection. 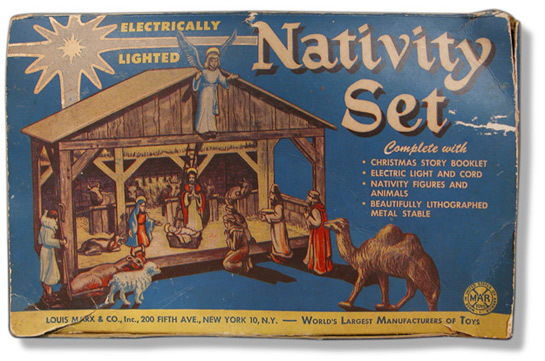 The nativity set shown above featured an illustrated pressed tin manger, an electric light, and figures of Baby Jesus, Mary, Joseph, the Arc Angel, the three wise men, various stable animals and others. Magic Marxie and the Marx Toy logos are copyright the Marx Toy Company, USA and are used with permission. This site is not affiliated in any way with the Marx Toy Company. All original content copyright The Flubber Gallery, 2008. Contact abbyw@flubbergallery.com for information.